The Society has an established reputation as one of the leading societies of lawyers in the Commonwealth. It is fully represented on the Council of the International Bar Association and played a substantial part in the formation of the Law Association for Asia and the Western Pacific. This stamp issue commemorated the centenary of the New Zealand Law Society which held an International Conference at Rotorua between 8 - 11 April 1969. Above are the three values in very fine used condition. Postal cancellations can be seen on each stamp. There were three values in this issue, a larger set than was normal for an anniversary/centennial issues. They are bright colourful stamps with the use of scrolls and other Law Society symbols to get their story across. 3c - Supreme Court Building, Auckland. 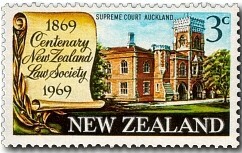 The first Supreme Court building was built on Queen Street, in the commercial hub of Auckland. When a larger building was needed, a new site was acquired beside the Parliament and Government House of the time, forming a government precinct. Architect Edward Rumsey designed the two-storey brick building in a neo-Gothic style, and when it opened in 1868 it was one of the colony's most impressive public structures. A novel feature of the building's facade were carvings by engraver Anton Teutenberg depicting prominent public figures including Ngāpuhi chief Hōne Heke. Today it is still used for the purpose it was built - a courthouse. 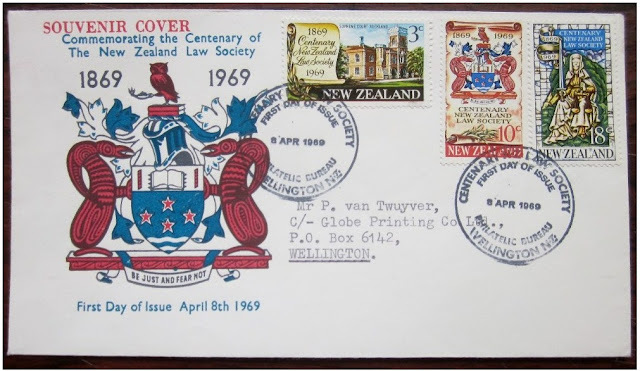 10c - New Zealand Law Society's Coast of Arms. in Christchurch, depicting the traditional figure of the blind "Goddess of Justice". 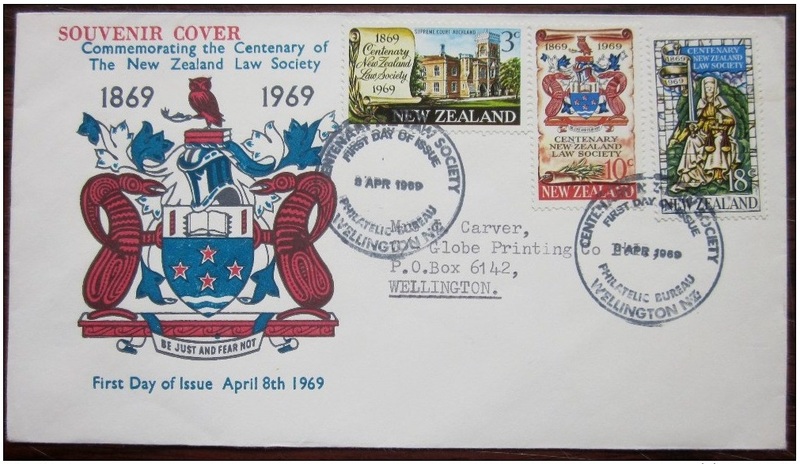 While all three First Day Covers shown here have the New Zealand Law Society's Coast of Arms, this cover appears to have used the same design as was used on the 10c value. 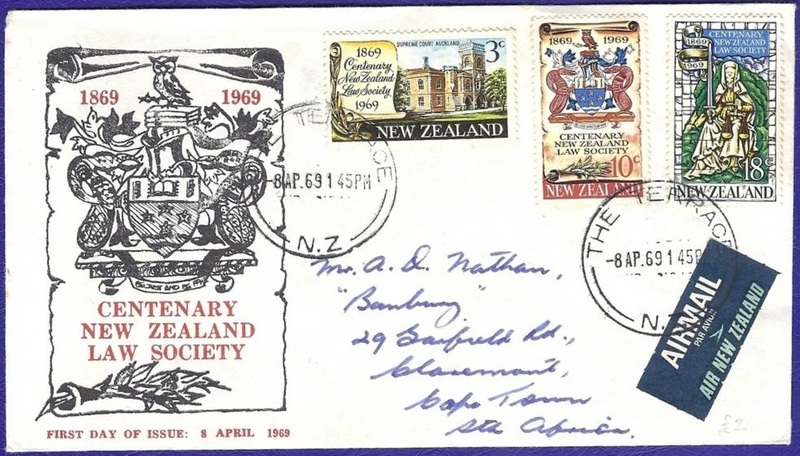 We could consider these two First Day Covers to be twins as they are of the same design, have the same basic layout and were sent C/- The Globe Printing Company. The only difference being that they were addressed to different officers of this company. 1969 3c Law Society selvage pair which is blue streaked across the design giving the appearance of a rain storm in the sky behind the courthouse building.